The Atlas Nitrile Touch CT Display is a tough and durable lightweight gloves with has excellent performance, comfort, and versatility. T he flexible nitrile coating provides a tougher protection than rubber, protecting palms and fingertips from the hectic every day work. Atlas Nitrile Touch CT Display is ideal for jobs requiring maximum dexterity and freedom of hand movement without the fatigue associated with bulkier gloves, heavier. Seamless lightweight black nylon knit liner increases comfort while it repels dirt and stains. The Gloves are washable, with extended cuff. The Lightweight nylon knit gloves just fit like a second skin. The product is tougher than rubber; the nitrile coating protects palms and fingertips from the hazards of serious gardening. 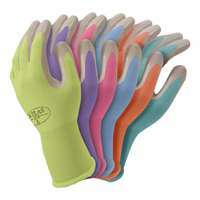 This Atlas Nitrile Touch Gloves is one of many top quality items in every Rubber Gloves department.